Deepen your sense of the past at sights like St. Andrew's Church and The House with Chimeras. Your cultural itinerary includes sights like Kiev-Pechersk Lavra - Caves Monastery and The Ukrainian State Museum of the Great Patriotic War. Spend the 26th (Mon) exploring the collection at Pirogovo Open-Air Museum. There's much more to do: make a trip to Sirotkin House, learn more about the world around you at St. Michael's Cathedrale, see the interesting displays at Mykola Syadristy Microminiatures Museum, and take in the architecture and atmosphere at St. Volodymyr's Cathedral. 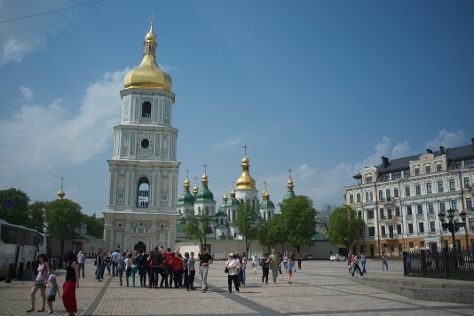 To see other places to visit, ratings, photos, and more tourist information, refer to the Kiev tour planner. Use the Route module to find suitable travel options from Columbus, USA to Kiev. You'll lose 7 hours traveling from Columbus to Kiev due to the time zone difference. In September, Kiev is little chillier than Columbus - with highs of 66°F and lows of 49°F. Finish your sightseeing early on the 28th (Wed) to allow enough time to travel back home.